The V-shaped seal offers a tighter seal between the dock and the trailer with the swing doors open. 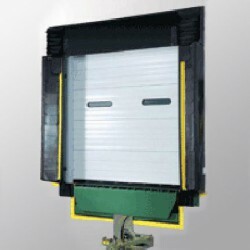 Heavy duty foam pads protect the building from inadvertent contact with a trailer. The integrated Head Curtain fits tightly to the top of the trailer and is very effective at sealing out rain and snow.